Resonic is an ultra-fast audio and music player / directory player / sample browser for the Windows operating system, built around a big waveform view. Resonic plays music files, sounds and samples out of your existing folders. It's built to be fast, reliable, and powerful. It does what it is supposed to do, without the bloat, and with exceptional usability. Resonic is extremely handy for wading through large numbers of audio files. It can be used and understood by anyone, but it also comes with features appreciated by advanced users, audio professionals, and music producers. The big waveform seekbar, the clean and clutter-free user interface, and fast file and folder navigation are just some of its essentials. Every important part of the application is optimized for speed and usability. Resonic Player is the bread & butter version and might even become your audio player of choice. It is completely free for personal use. Resonic Pro will evolve the free version into a powerful creativity tool, introducing workflow-improving, unique features for advanced users and audio professionals. This is presently the best software I've found to quickly browse through audio files. And it's getting better and better, with a new improved version and a pro version being developed that also allows for various useful (basic) editing. Tip: in the new version you can drag & drop any folder from your desktop onto the "File List" area. It will instantly open and be selected in the "Browser" list, with its content readily available. Awesome! Resonic makes extensive use of multi-core processing. Every important part is optimized for speed, which results in extremely fast browsing, seeking, and playback. A couple of files, a few megabytes, low memory footprint, and tidy use of disk space. No bloated runtime packages are required. DLL files are not loaded on startup, but whenever they are required, which tailors memory usage to your behavior. In order to achieve the purest sound quality, there is absolutely nothing between decoded audio and sound output that might degrade quality, which is essential for both sound and sample previewing and audiophile audio playback. Resonic's audio engine runs on 32-bit floating point data. A major design goal is to always keep the graphical user interface clutter-free and user-friendly, without nested menus and dialogs, and without dumbing down the more powerful features. 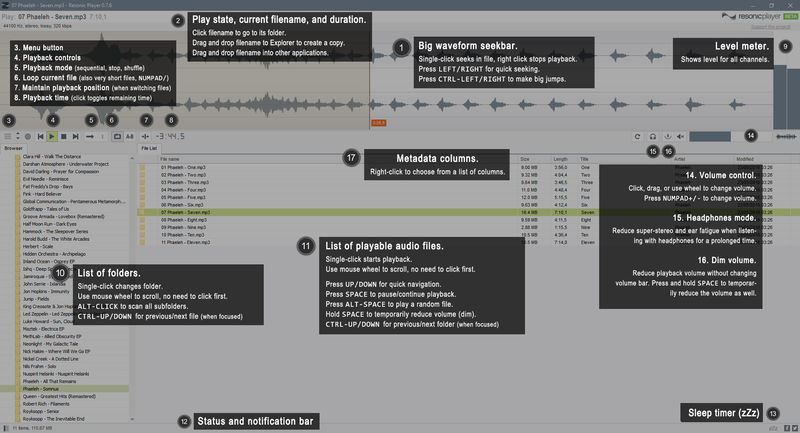 A single Left-Click navigates folders, plays files, seeks in audio, changes volume. No need to double-click just for the sake of it, but optionally available. Move the mouse over controls and use the wheel to scroll lists, or to change volume. No need to click them first. Once you know the basic shortcuts you'll see how fast and comfortable keyboard-supported operation of Resonic really is. Resonic supports Windows 10, 8, 8.1, and 7 and is optimized to run smoothly on the latest versions of the operating systems. Resonic plays all your music and sound files directly out of existing folder structures. While library support will be part of Resonic you are never forced to use any kind of library system. Since music libraries usually rely on tags they can easily end up being a confusing mess unless these tags are maintained properly. Many users do actually prefer to organize their music into folder structures, most commonly on external drives. For audio professionals, it is vital to have a powerful preview tool at hand. Sample CD/DVD structures can be tedious to browse through. Even more so are sample libraries and collections as they tend to become huge fast. Resonic has its origins in this particular field of work and will certainly become an invaluable asset when it comes to your everyday work. I was not aware that this software was around. It's much needed. Thanks again. genau so was hab ich auch gesucht.